Who is the Holy Spirit or what is the Holy Spirit? Is it a force, an energy, a power, or is He a person? We can find out by reading the Bible. God the Holy Spirit is a Person. He is not a power, an effect, or just energy. God the Holy Spirit does have energy (limitless), can affect things, and does have power (God’s power), but He is much more than these attributes. Almost every single time that the New Testament mentions “the Spirit” this is in direct reference to God the Holy Spirit. There are three members of the God Family. This family includes God the Father, Jesus Christ the Son of God, and God the Holy Spirit. Each member of the Trinity has a part in a person’s coming to saving faith in Jesus Christ. God the Father draws them (John 6:44), Jesus saves them (John 3:16), and the Holy Spirit tells us Who that Savior is – Jesus of course. Each member of the Trinity has a part in a person’s coming to saving faith in Jesus Christ. 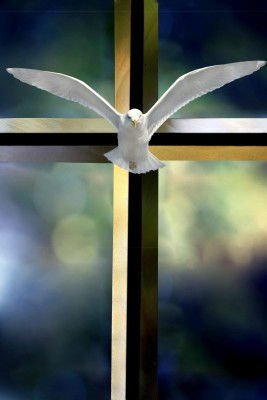 The Holy Spirit is the least understood of the Trinity of God. He is the most neglected even though He is involved perhaps the most in a believer’s life. The Holy Spirit is the One Who reveals Who the Savior is and opens up our minds to understand the Word of God because flesh and blood does not bring meaning to the Scriptures. We can not understand what we are reading unless the Holy Spirit teaches us and imparts meaning to us. Almost every time you read reference to the “Spirit”, particularly in the New Testament, it is speaking of God the Holy Spirit. The “Spirit” is the Spirit – God the Holy Spirit. The Spirit is not a force to be drawn upon like a power but drawing on the power of God. He is the very power of God. You can not know Jesus without Him. You can not possibly overcome sin without His power. You can not have eternal life without His revealing the Source of this eternal life (John 3). When you sit down to read the Bible, pray for the Holy Spirit to give you understanding. Pray that He will reveal what is being read in the Bible for part of the role of the Holy Spirit is to teach us all things, as Christ told the disciples before He departed. The Holy Spirit is also a Helper, a Comforter and He teaches us about the things of God (John 14:26, Luke 12:12). God the Holy Spirit also guides us in revealing the meaning of God’s written Word (John 16:13) and reminds us of things we need to remember (John 14:26). If you want to know a sort of job description of the Holy Spirit, John, chapters 14, 15 and 16 will help immensely. Romans chapter 8 is also a chapter that describes the role and work of God the Holy Spirit. It mentions “the Spirit” frequently in this chapter and this Spirit is none other than God the Holy Spirit. God the Holy Spirit brings godly repentance and brings about an awareness of when we are not doing the right thing. He will begin to deal with the sins in our life and help us overcome them. We are not the ones necessarily that conquer sin; God the Holy Spirit is the power that dwells in us to help us do this. We can not possibly overcome sin by human effort. This doesn’t mean that the Holy Spirit stops all the urges nor will He stop our returning to sin, but the Holy Spirit prompts and urges the believer to not engage in such behavior as well as other ungodly acts. God the Holy Spirit enables us to do good works – not to be saved – but because we are saved. The Holy Spirit also points to and always seeks to glorify Jesus Christ. So too should we. In this way, we can join in purpose with God the Holy Spirit to glorify Jesus Christ. The next time you think of the Holy Spirit, think of Him as God Himself. For the Holy Spirit is God, was God, and will forever be God. Jesus is also called Immanuel (God with us); God the Holy Spirit is God in us; if we are Christians. That is Who the Holy Spirit is. May we use your articles for our weekly bible study? That would be great! If you do post it somewhere online we require a link back to the original article. Thank you Sarah that you deem this good enough to use in a Bible Study. I truly believe that God the Holy Spirit is the least known and the least worshiped because He always seeks to glorify Jesus Christ and that is something that I too, weak and feeble as it may be, to do the same thing. To God be all glory, honor, praise, worship, and credit. Apart from Him, I am nothing! Thank you Sharna for your encouragement. May God bring you back here soon. Is it true that God is not Jesus? God is the “creator”. In [the] beginning the Word was, and the Word was with God, and the Word was a god. This one was in [the] beginning with God. All things came into existence through him, and apart from him not even one thing came into existence (John 1:1–3). and dozens more. This should prove, according to the Bible that Jesus is both God AND Creator but let me say that creation is a work of all Three Persons of the Trinity. Dearly pastor Jack Wellman, it is very clear to about the holy spirit.I am very much interested to read your articles.I would like to use your articles in sermones. Thanks a lot in christ. Pls pray for my ministry. Hello Pastor Joseph. I will pray for you fellow pastor and you are welcome to use whatever you wish. May God richly bless your ministry sir. I’m really impressed with your writing skills as well as with the layout on your blog. Is this a paid theme or did you modify it yourself? Anyway keep up the nice quality writing, it is rare to see a nice blog like this one nowadays. Luke:2-52 -and Jesus increased in wisdom and stature, and in favour with God and man. Luke 3:21-22. (where John is baptizing Jesus)…Thou art my beloved son; in thee I am well pleased. There are many more but especially, Luke:23-46 “and when Jesus had cried with a loud voice, he said Father, into thy hands I commend my spirit. Thanks Linda. Here is a link that shows that Jesus is God and has always been God and as such, was not created. do they properly spelt or I misunderstood, I feel the below verse wrote in reverse. I mean it should not do like mentioned below. it might be wrote like. .
No my friend, you are not wrong but my point in this article is that God the Holy Spirit is a Person and we can lie to Him and quench Him but yes, we shouldn’t do so. Thank you. I am a little confused about actually praying to the Holy Spirit. I have always read in the scriptures that we are to pray in the power of the Holy Spirit. I can not find one scripture where anyone has ever actually prayed to the Holy Spirit. The scriptures clearly tell us exactly how to pray as far as I have studied. There are several examples of Him telling us to pray directly to God the Father, in the name of Jesus, but never to the Holy Spirit. We were never given permission to pray to the Holy Spirit but to pray in the “power” of the Holy Spirit. The way I see it, we should always pray to God the Father, in the name of Jesus and we can ask Him to give us the power of the Holy Spirit. Please give me some verses that say it is okay for us to pray to the Holy Spirit. Thank you. Thank you so much Denise. I re-read my article and didn’t see where I wrote that we should pray to the Holy Spirit but we are to pray IN the Spirit. You are right, we are to pray to God the Father and in the Name of Jesus Christ. I agree, we should always pray to the Father and in Jesus’ name. Can you show me where I said that we are to pray TO the Holy Spirit? Thank you Denise for your keen insight. Thank you for your response Jack. The title to your article is “Praying to the Holy Spirit”, so one would be lead to believe that everything written under this title is about praying TO the Holy Spirit and not IN the Spirit. There is a big difference, so you may want to change your title if this is not the interpretation that you are trying to convey to your readers. It is very well written by the way. Thank you for taking time to share God’s word! Thanks Denise. This was a subheading actually but you are right my friend. Done! I appreciate you. Got it Denise. I clearly understand what you said and took care of it my good friend. Again, thank you…and you are so right…our Bible studies must be biblically sound so thank you for your keen insight. Think you for this article Jack, I am working on being humble and was wondering how do I let the Holy Spirit work that out in my life? I know that apart from god we can do nothing. What should I do while I’m letting the Holy Spirit work in my life? Hello Genesis…the Holy Spirit always seeks to glorify Christ and points all believers to obedience to God and the Bible, therefore what you can do to let the Holy Spirit work in your life is to yield to God’s Spirit and witness to others and to glorify God in your Body. For more on what the Holy Spirit does and can do through you read Romans 8 which is all about what the Holy Spirit seeks to do in us. Another wonderful article with Scriptures! Thank you bunches! If we can pray (converse, talk with, too,) with our Father and Jesus, why NOT His Holy Spirit also? Throughout the day I often call out to God’s Holy Spirit when I become upset, befuddled & even share joyful moments with Him as I do with our Father and Jesus, my beloved Savior. doing something our Father doesn’t want me to do, and explain in your inspirationally wonderful way if the answer is negative. No way do I ever want to offend our Father!! God’s wonderful blessings & graces be showered upon you, Pastor Jack, and your family!!! Patty…I think what you are doing is exceptionally good. I trust your judgment. I just got home from church and have to work and so may have a short answer but even on my birthday I have a touch and go…to work and wont’ return home till late and heading off to travel into snow and am exhausted. Thanks for your prayers. Keep doing wha tyour doing. HAPPY, HAPPY BIRTHDAY, PASTOR JACK!!!! I pray you at least have some cake & ice-cream!! Thanks…still at work…I got no cake or icem but got some new jeans and some socks….thanks my friend. I wish I didn’t have to work on my birhtday all day but I am still blessed. Exausted with school (seminary), family, work, pastoring, the website, and more but thnank GOd anyway. As to the Second Coming of Christ, Jesus Christ revealed the holistic consciousness (the Holy Ghost) of all when He said, “I AM THE TRUTH, LIFE, AND THE WAY.” I suspect most will be offended, but that statement revealed that All men are potential Christs but suffer from Spiritual Amnesia, due to Satanic religious and secular conditioning instead of finding balance in Life by exercising one’s God’s given Gift of Divine Awareness. In such a simple shift in Consciousness lies the Salvation that all seek. So the Bible tells us that Jesus isn’t ‘God’s human son’, rather, that Jesus, who is co-eternal with God (that means that like God, he existed forever) became human. Jesus was like God – eternal and perfect – but he became human so that he could enter into our world and die for humans. The Bible treats this as something to marvel at: … Jesus Christ ‘though he was in the form of God, did not count equality with God a thing to be grasped, but made himself nothing, taking the form of a servant, being born in the likeness of men. And being found in human form, he humbled himself by becoming obedient to the point of death, even death on a cross.’ (Philippians 2:6-8) The actual ‘mechanics’ of how God had a human son are not explained to us, but we are left in no doubt that Mary’s conception and pregnancy are miraculous – you could read chapter 1 of the gospel of Luke to see the angel tell Mary that she will fall pregnant. The gospel of John, which is written in very symbolic language at the beginning, speaks about ‘the word becoming flesh’. ‘The word’ is Jesus – who was with God in the beginning – and he became flesh – this is what ‘incarnate’ means – to be made flesh. If Christ is God then why is it; that He speaks from Heaven saying This is my beloved SON. They are unified as ONE is the same efforts, do not confuse people. Hello Grace. God always answers our prayers, but sometimes its wait, I am working things out…sometimes it is no, and sometimes, its no, because I’ve got something better for you. Trust God. Obey Him. Everything else will work out as long as we are seeking Jesus’ righteousness and His kingdom first and above all (Matt 6:33). Thank you for your article on the Holy Spirit. I’ve been reading some of the comments made on speaking to the Holy Spirt or praying in the power of the Holy Spirit etc. The question is if the Holy Spirit is a Person why can’t we talk to Him. Talking and praying is the same thing isn’t it. I mean when I don’t understand anything when reading the bible I normally would say Holy Spirit I really don’t understand this can you enlighten me on this scripture seeing He is the teacher, the counsellor. A student would talk to the teacher. Hello friend and thank you for your comment and qeustion. Yes, I do believe we can talk to the Holy Spirit and ask Him to help us resist sin, open up the Word of God, and so forth. I do agree…we should thank God the Holy Spirit for He is in us after conversion. You bring up excellent points sir.